Daryl Johnson (Worcester Park, United Kingdom) on 11 April 2014 in Architecture. Docomo Tower looming over Shinjuku Park; I previously photographed it in 2008. Thanks to YOU...I know now WHAT that building looming over the gardens is! I've captured it so many times, in spring and autumn, and never knew the DOCOMO was inside there! Thank you for this piece of imformation! On the other hand, most cherry trees remained without flowers, but the petals make carpets of delicate and intricate texture for out feet to step on carefully....OR...they choose to dance crazily with the winds..Some have landed in my balcony...what joy! Very 'stately' profile here and I take it the return angles carry the clock faces that once made it 'the world's tallest clock tower'. For Gabriella's benefit, it seems that NTT Docomo own the building rather than occupy it. @Ronnie 2¢: Thanks Ronnie - yes, not every side has a clock face apparently. Maybe there's just the one? I can't tell! 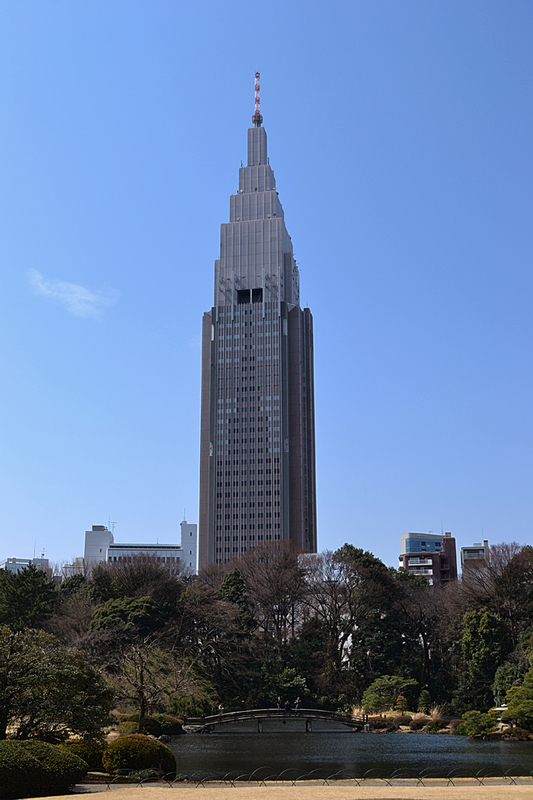 As I'm sure you've now seen, and I've just realised, it's officially called the "NTT Docomo Yoyogi Building". A fine persperctive to this impressive building Daryl! A handsome shot of the park and tower. I especially enjoy the classic bridge in the shadow of the monolith.